Eventually, I'm going to sew something other than skirts for myself. Skirts are like a drug. They're so fun to make. And they look so good with boots and heels and sandals. And they can be drafted in one's sleep, which is my usual state of mind when I'm drafting them late at night. 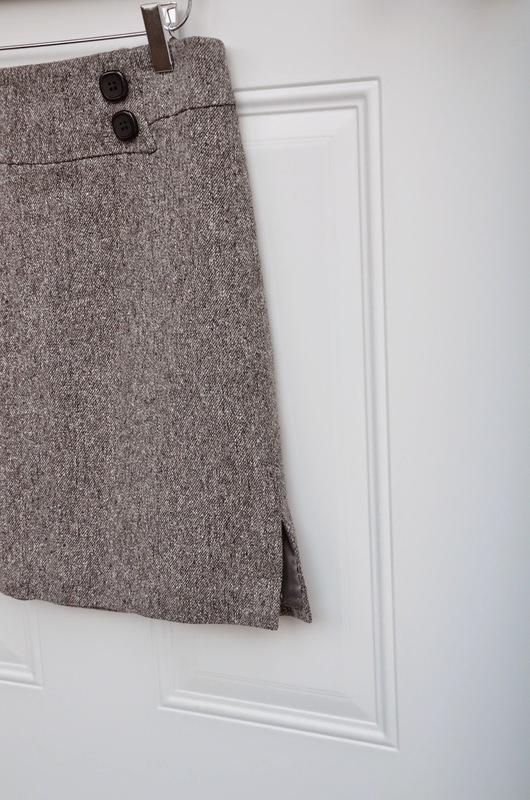 And they're easy to fit and sew up fast, unlike entire dresses or jackets or coats or pants. And there are sooooooooo many variations on lines and embellishments and piecing and styling. I am addicted to skirts just like I am addicted to princess seams. This fall/winter, to celebrate the opening of the new Mill End branch (argh! I apologize! I meant SR Harris! Sorry!) near home, I went out to buy wool. To supplement the wool stash I already had at home, I mean. They have a really nice wool selection for such a tiny outlet (tiny compared to their main store) and half of it was actually affordable. Someday, I might convince myself to fork out the cash to buy some of their truly gorgeous higher-end yardage, but until then, I'm happy with these. 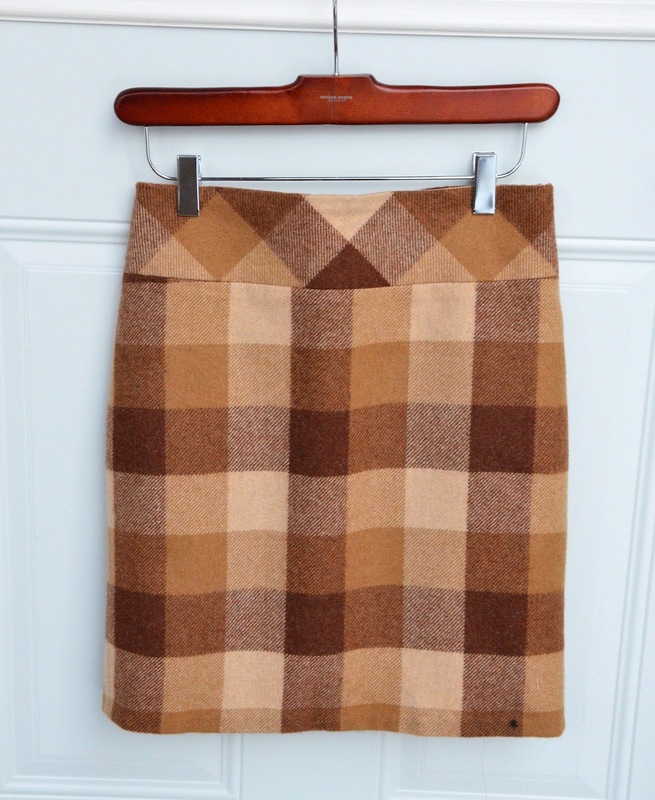 Apologies for not actually showing you these skirts on me or Fleur (both of us are too lazy to dress up and stand out in the cold). So you get hangers instead. 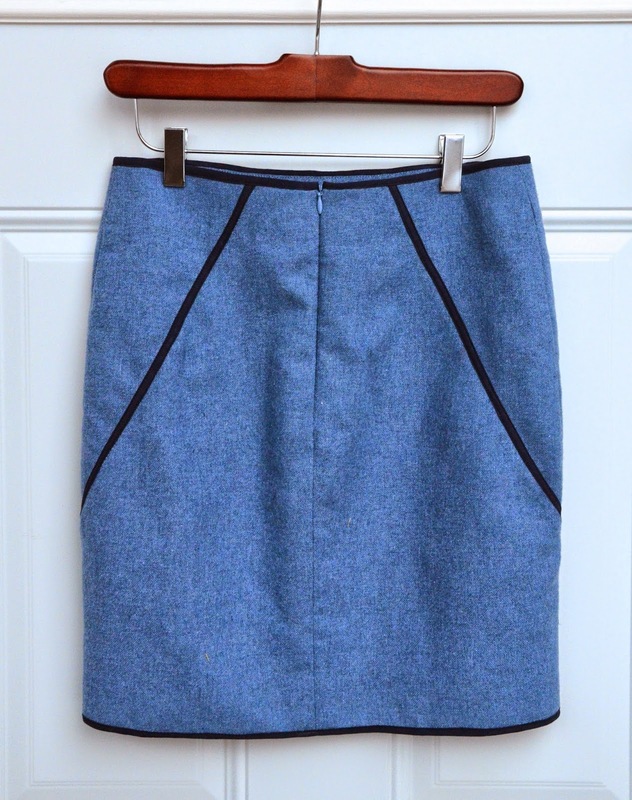 It is a very boring pencil skirt just to test my newly-altered skirt block and experiment with interfacing. So yes, it's a muslin. 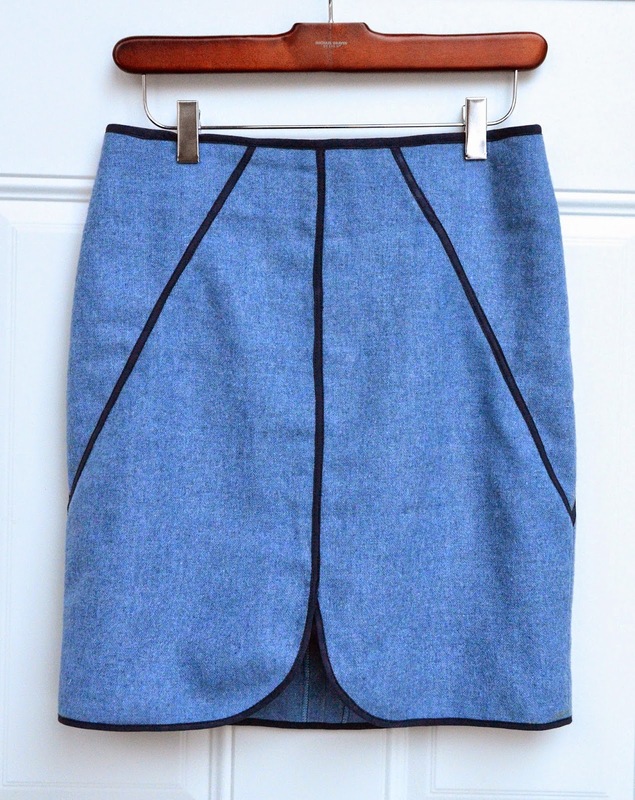 Nothing interesting, detailwise, other than a wide-than-typical waistband. 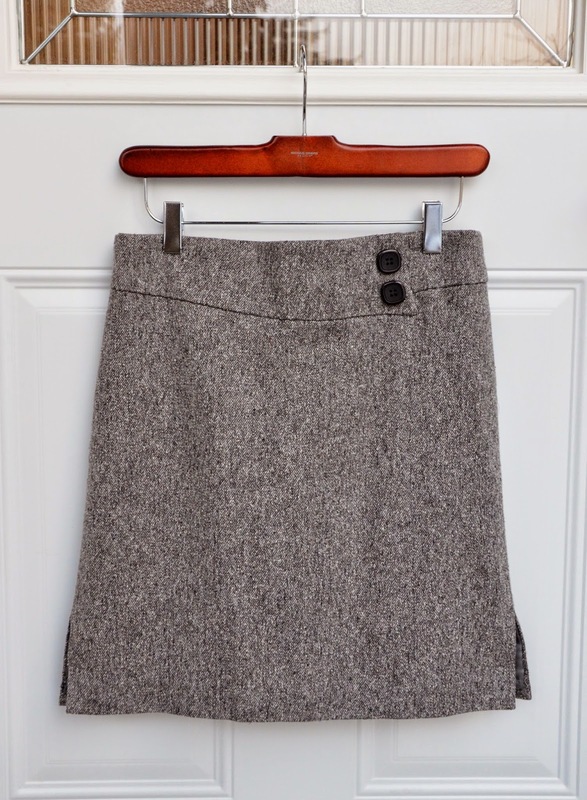 Skirt #2 is one of those classic British tweed miniskirts. Only two details worth mentioning: the first is the panelling - a big central front panel all the way up to the waistline, and two side panels with waistbands cut on the bias simply for aesthetics. 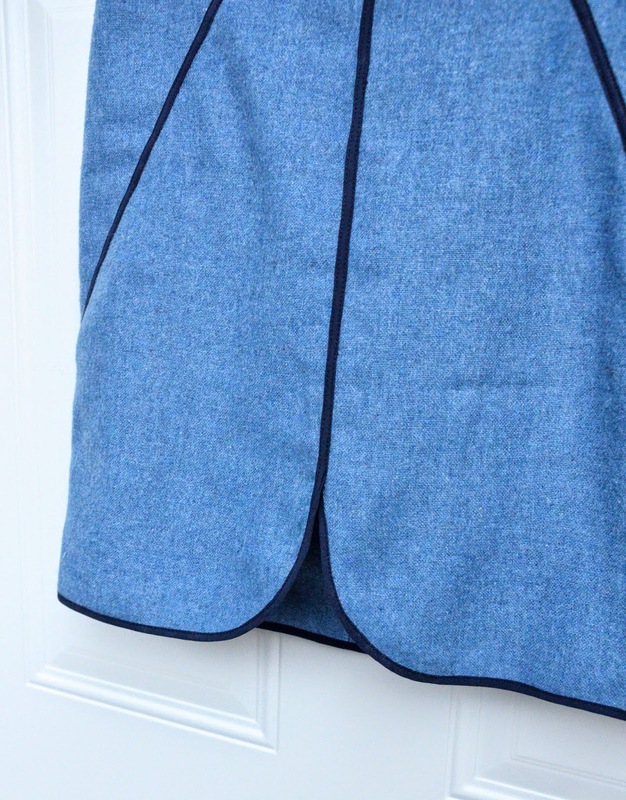 The second are two front pleats along the side of the front panel. 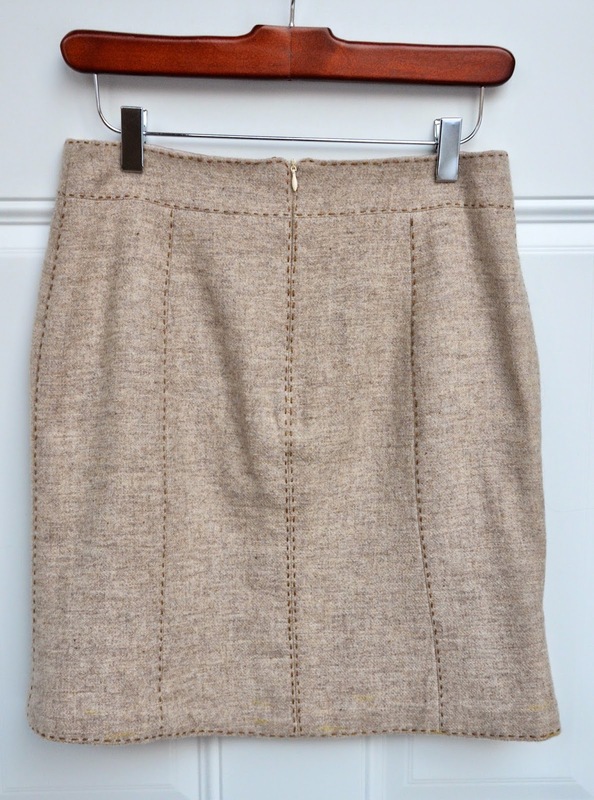 Skirt #4 is an oatmeal paneled skirt with saddle-stitching. 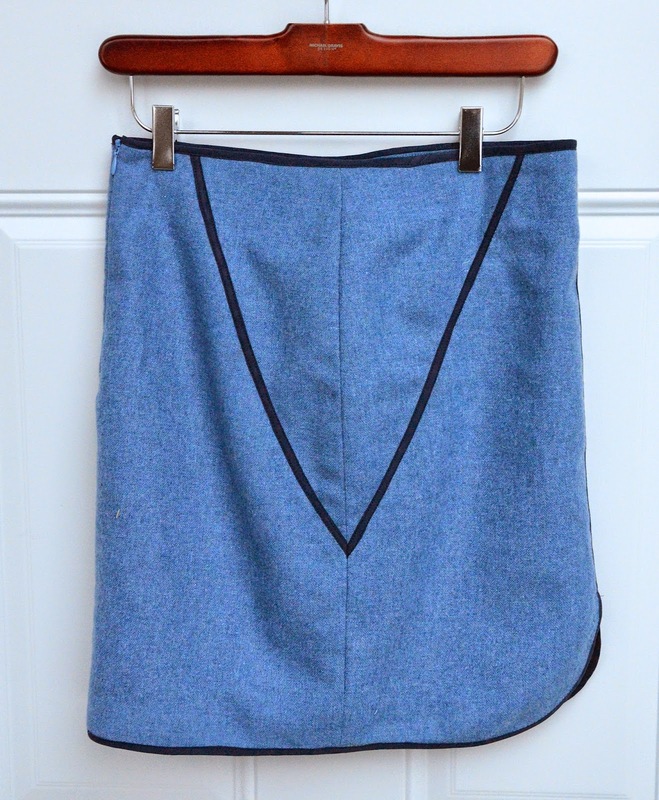 Skirt #5 is interesting because of the seaming and the binding, which necessitated a reverse assembly process. The front piecing is all aesthetics. The back seaming is functional - those two diagonal lines are really waist darts to shape the waist and hip. 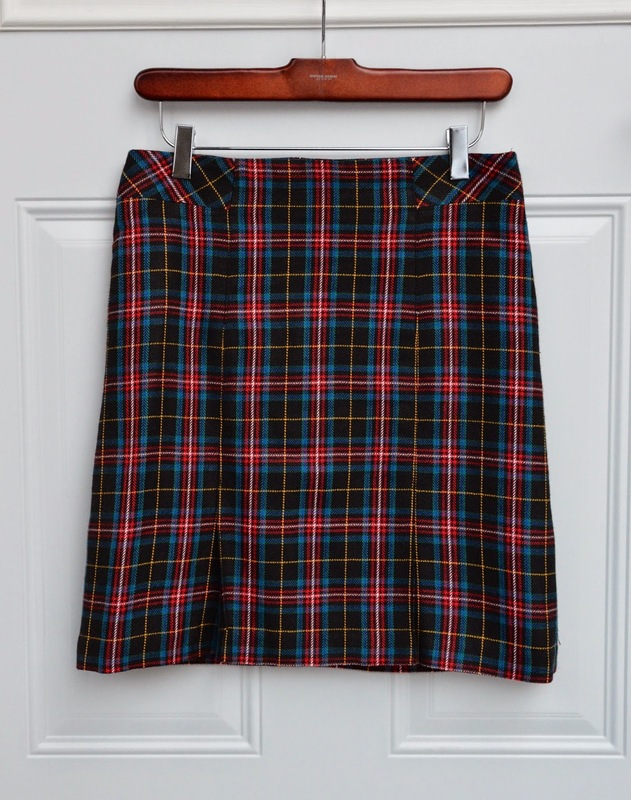 So they're like french darts or raglan lines for skirts, you know? A bit fiddly to do the dart transformation on this one, but still fun. 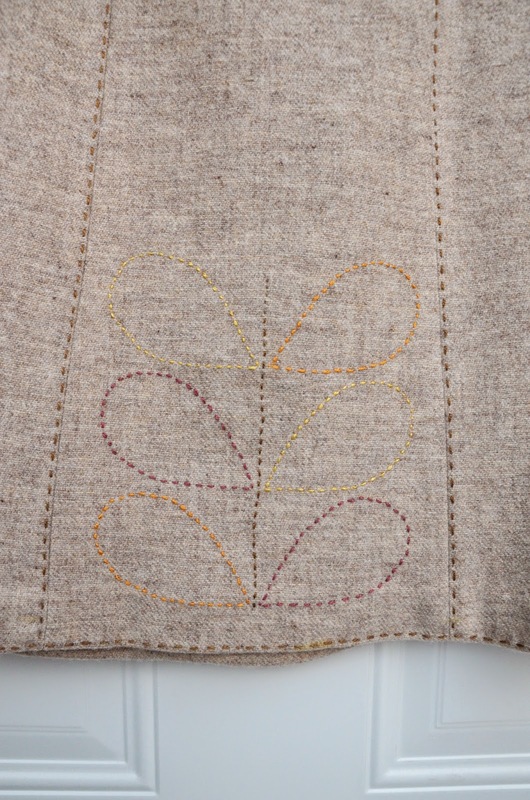 Here's the side seam showing the way those two lines meet in a V.
These are all lined, incidentally. 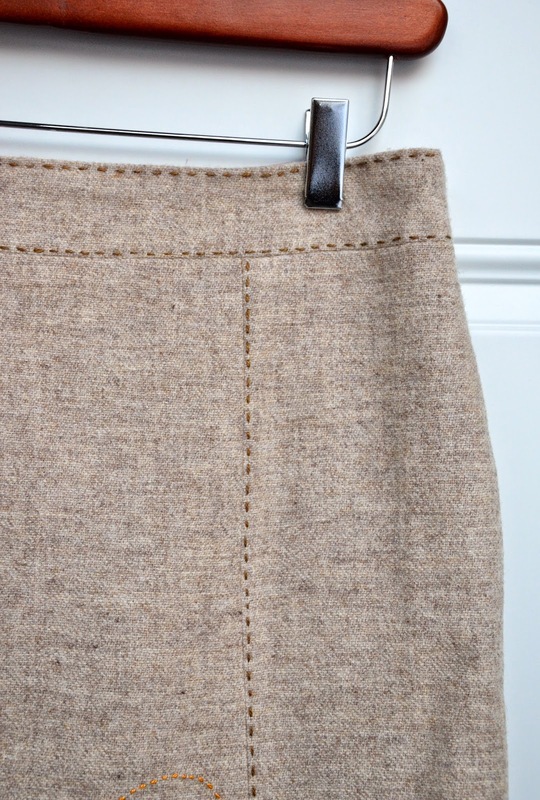 Unlined skirts are not exciting to wear. Unless they are flouncy summer skirts that just have to puff up and look happy and casual and don't need to drape or fall. 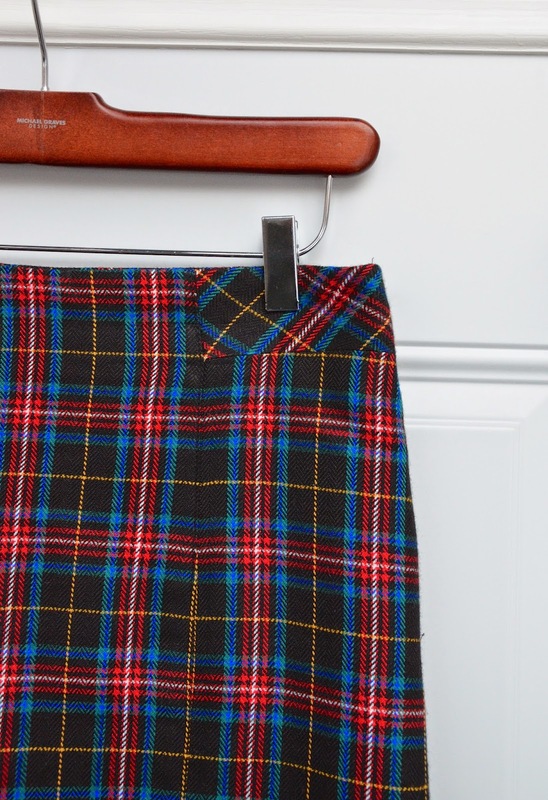 Also I skipped pockets altogether - I hardly use them on these slightly more formal skirts anyway and they're not worth the extra time to piece. I have two sweater dresses that I might make next. And one jacket. All lined. 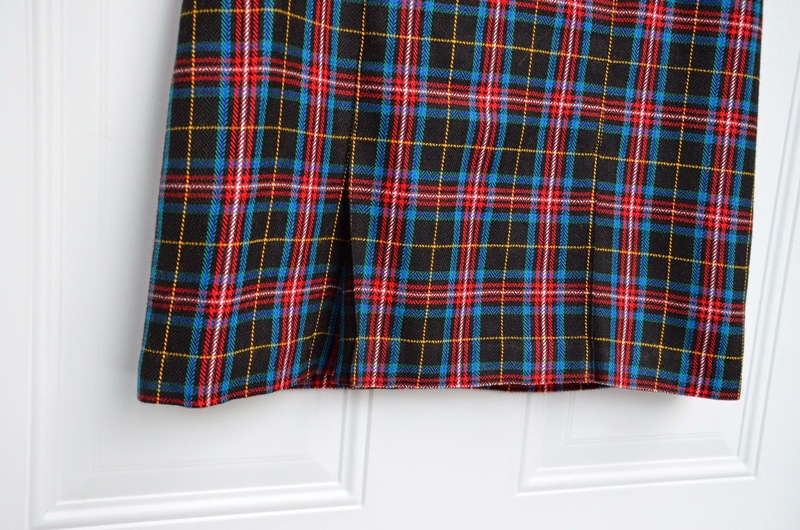 Pity they take longer than skirts; I might lose interest before they're even drafted. 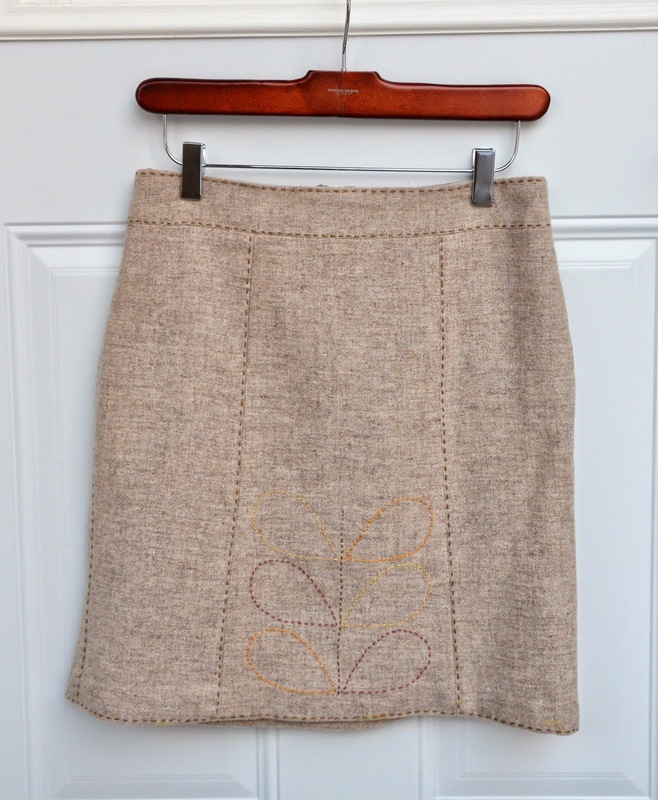 Great skirts, I love the sadle stichted one. I say you know how to leverage your time and effort for maximum output! Lovely skirts! I like them all. But I think I have a preference for #2. Mill End re-opened ? I'll have to look at that ! Cecile: No! My fault! I am an idiot. I meant SR Harris. If it really were Mill End that re-opened, I'd be buying more than just wool to celebrate. All are lovely. I especially like the subtle embroidery.